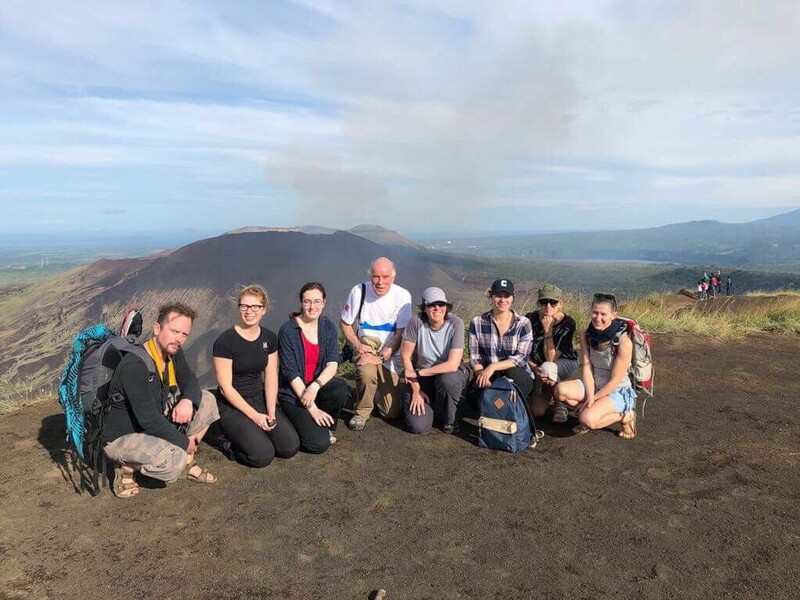 Professor Tamsin Mather, a volcanologist in Oxford’s Department of Earth Sciences reflects on her many fieldwork experiences at Masaya volcano in Nicaragua, and what she has learned about how they effect the lives of the people who live around them. Over the years, fieldwork at Masaya volcano in Nicaragua, has revealed many secrets about how volcanic plumes work and impact the environment, both in the here and now and deep into the geological past of our planet. Working in this environment has also generated many memories and stories for me personally. From watching colleagues descend into the crater, to meeting bandits at dawn, or driving soldiers and their rifles across the country, or losing a remotely controlled miniature airship in Nicaraguan airspace and becoming acquainted with Ron and Victoria (the local beverages), to name but a few. I first went to Masaya volcano in Nicaragua in 2001. In fact, it was the first volcano that I worked on for my PhD. It is not a spectacular volcano. It does not have the iconic conical shape or indeed size of some of its neighbours in Nicaragua. Mighty Momotombo, just 35 km away, seems to define (well, to me) the capital Managua’s skyline. By comparison, Masaya is a relative footnote on the landscape, reaching just over 600 m in elevation. Nonetheless it is to Masaya that myself and other volcanologists flock to work, as it offers a rare natural laboratory to study volcanic processes. Everyday of the year Masaya pumps great quantities of volcanic gases (a noxious cocktail including acidic gases like sulphur dioxide and hydrogen chloride) from its magma interior into the Nicaraguan atmosphere. Furthermore, with the right permissions and safety equipment, you can drive a car directly into this gas plume easily bringing heavy equipment to make measurements. I have heard it described by colleagues as a ‘drive-through’ volcano and while this is not a term I like, as someone who once lugged heavy equipment up 5500 m high Lascar in Chile, I can certainly vouch for its appeal. Returning for my fifth visit in December 2017 (six years since my last) was like meeting up with an old friend again. There were many familiar sights and sounds: the view of Mombacho volcano from Masaya’s crater rim, the sound of the parakeets returning to the crater at dusk, the pungent smell of the plume that clings to your clothes for days, my favourite view of Momotombo from the main Managua-Masaya road, Mi Viejo Ranchito restaurant – I could go on. But, as with old friends, there were many changes too. 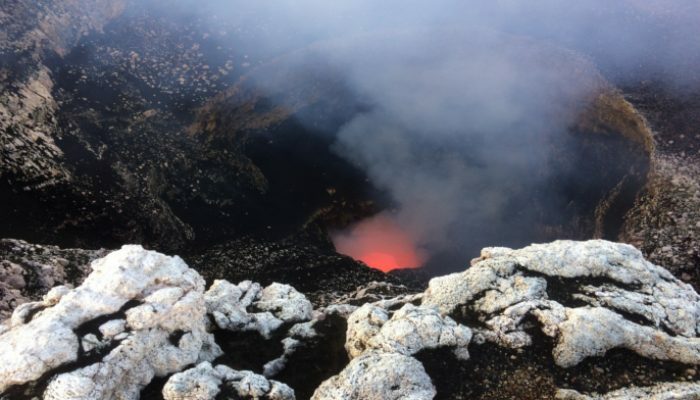 Although in the past I could often hear the magma roaring as it moved under the surface, down the vents, since late 2015 a combination of rock falls and rising lava levels have created a small lava lake visibly churning inside the volcanic crater. This is spectacular in the daytime, but at night the menacing crater glow is mesmerising and the national park is now open to a stream of tourists visiting after dark. Previously, I would scour the ground around the crater for a few glassy fibres and beads of the fresh lava, forced out as bubbles burst from the lava lake (known as Pele’s hairs and tears after the Hawaiian goddess of the volcano – not the footballer) to bring back to analyse. 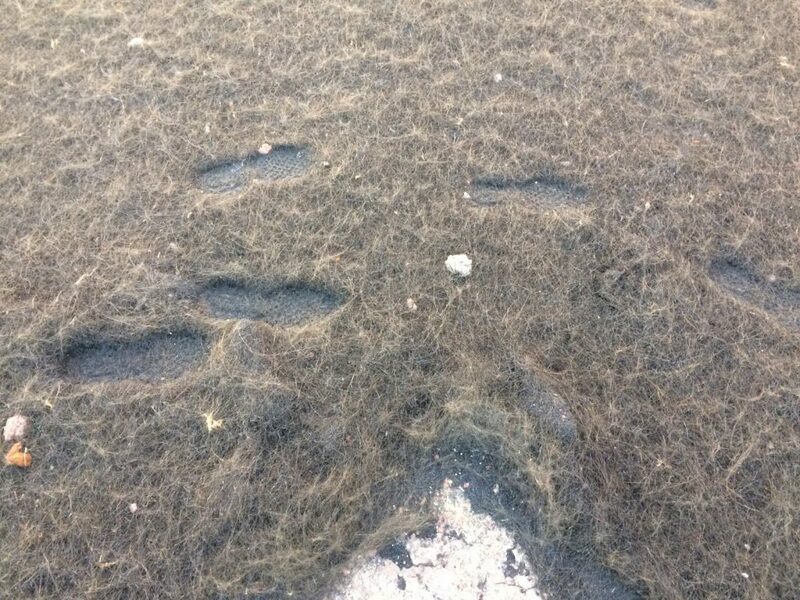 Now the crater edge downwind of the active vent is carpeted with them, and you leave footprints as if it were snow. New instruments and a viewing platform with a webcam have been put in, in place of the crumbling concrete posts where I used to duct-tape up my equipment. This time my mission at Masaya was also rather different. Before I had been accompanied solely by scientists but this time I was part of an interdisciplinary team including medics, anthropologists, historians, hazard experts and visual artists. All aligned in the shared aim of studying the impacts of the volcanic gases on the lives and livelihoods of the downwind communities and working with the local agencies to communicate these hazards. Masaya’s high and persistent gas flux, low altitude and ridges of higher ground, downwind of it, mean that these impacts are felt particularly acutely at this volcano. For example, at El Panama, just 3 km from the volcano, which is often noticeably fumigated by the plume, they cannot use nails to fix the roofs of their houses, as they rust too quickly in the volcanic gases. The team was drawn from Nicaragua, the UK and also Iceland, sharing knowledge between volcano-affected nations. Other members of the team had been there over the previous 12 months, installing air quality monitoring networks, sampling rain and drinking water, interviewing the local people, making a short film telling the people’s stories and scouring the archives for records of the effects of previous volcanic degassing crises at Masaya. 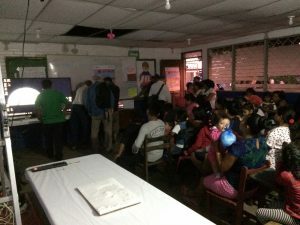 Although my expertise was deployed for several days installing new monitoring equipment (the El Crucero Canal 6 transmitter station became our rather unlikely office for part of the week), the main mission of this week was to discuss our results and future plans with the local officials and the communities affected by the plume. Having worked at Masaya numerous times, mainly for more esoteric scientific reasons, spending time presenting the very human implications of our findings to the local agencies, charged with monitoring the Nicaraguan environment and hazards, as well managing disasters was a privilege. With their help we ran an information evening in El Panama. This involved squeezing 150 people into the tiny school class room in flickering electric light, rigging up the largest TV I have ever seen from the back of a pick-up and transporting 150 chicken dinners from the nearest fried chicken place! But it also meant watching the community see the film about their lives for the first time, meeting the local ‘stars’ of this film and presenting our work where we took their accounts of how the plume behaves and affects their lives and used our measurements to bring them the science behind their own knowledge. Watching the film it was also striking to us that for so many of this community it was the first time they had seen the lava lake whose effects they feel daily. Outside the school house there were Pele’s hair on the ground in the playground and whiffs of volcanic gas as the sun set – the volcano was certainly present. However, particularly watching the film back now sitting at home in the UK, I feel that with this trip, unlike my others before, it is the people of El Panama that get the last word rather than the volcano. Blog written by Tamsin Mather (University of Oxford). You can follow the project on Twitter @UNRESPproject. UNRESP project is funded by GCRF Building Resilience programme.